Japanese post match interviews are to cry for. Of her bronze medal Ami Kondou said, "I guess my parents will say 'well done,' (and for that I'm grateful) but I just feel regret." The judoka pictured above said the traditional, "I feel full of gratitude to all those that made my achievement possible," while clearly feeling other emotions, such as regret, at the same time. However, while each individual judouka's emotions seem to be similar to those in previous years, several of them are voicing statements which, coming from judoka, are new to my ears. 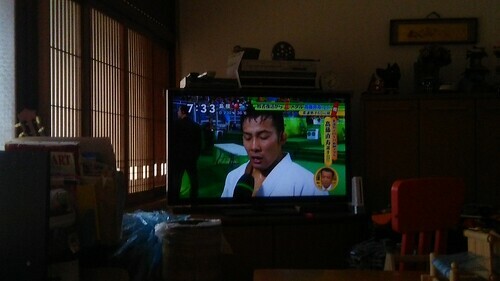 Specifically, several Japanese Olympic judoka have mentioned that they "should have won (gold)" (勝って当たり前). Ami Kondou said that bearing in mind the large numbers of Japanese judoka, she "should have won." Even Shouhei Oono, who did in fact win gold mentioned, this phrase four times, but as the words of others, not thoughts of his own. Perhaps that is how he managed to break the curse (see below). "I heard it said, from those around me, that "I should win gold. (Today) I reconfirmed the fact that it is difficult achieve that which one 'should achieve'." "周りの声、金メダルを獲得して当たり前という声が聞こえていた。当たり前のことを、当たり前にやる難しさを改めて感じた。(Kyoudou)(Youtube Video in Japanese)." Other commentators have noted that this teams inability to be pleased at receiving bronze medals, together with the high number of bronze medals suggests that the team need to be freed from some sort of curse. I agree. I fear that one or some of the Judo team coaches have been reading "positive psychology" (or Western whispering arrogance) books, and have been persuaded that telling yourself that you "should win" / "must win" will increase confidence, for the win. As argued by cultural psychologists such as Steven Heine (Heine, Lehman, Markus, & Kitayama, 1999), this Mohammed Ali style self-praising, ego-boost is by no means a Japanese tradition. Cultural psychologists will tell you that Japanese are instead self-critical, and by focusing on their mistakes and errors (hansei) they go on to remove and improve themselves (kaizen). Certainly there is this aspect to Japanese psychology. Rather than telling themselves that they "should win" the Japanese Judo team should have maintained the challenger spirit that helps to drive Toyotistic cycles of Japanese self-improvement. For example, the coach of the world beating Japanese women's soccer team showed a video of the Fukushima Disaster on the eve of their final match. Nothing could have been more convincing of their own weakness: anyone can lose everything. That coach, Asako Toyokura, is a genius. It is not all deprecation, self-sour-grapes, in the Japanese psyche. As argued on this blog, the Japanese indulge in positive visual psychology. The late great Sumo Wrestler, Chiyonofuji, who died 11 days ago RIP, said in a television interview when asked how he recovered from injury, "I imagine myself winning and that there are a lot of girls cheering in the audience." This J-narcissism, rather than the collectivist expectation of gratitude alone, drives the amazing Japanese ability to self-criticise and improve. The drawbacks to telling oneself we should win must win are not only that it puts a spanner in the Japanese self-improvement cycle. Linguistic self-praise which seems to take place both inside the heart and head, is particularly evil. Mohammed Ali knew, and was not arrogant at home. Whispering praises to oneself linguistically, one can become completely unaware of the need for others, such as "the girls cheering in the audience." As a consequence one can believe ones self-praise completely, as some sort of objective truth, WE MUST WIN, wipe other species (Kashima & Bain, 2016), and in the extreme, wipe out other humans. Kashima, Y & Bain, P. (2016, August, 3) "On Cultural Conceptions of Human-Nature Relationship." International Association of Cross Cultural Psychology Conference. WINC Conference Center, Nagoya, Japan.